[London: 1st May 2018]: Royal Wharf, Ballymore & Oxley’s flagship development in London’s Royal Docks, will join the capital’s finest architectural plans, projects and minds as part of the annual London Festival of Architecture. Taking place throughout the month of June, London Festival of Architecture seeks to celebrate the leading lights of architectural experimentation, thinking and practice. Within this year’s programme, Ballymore & Oxley will host an event on the evening of 26th June at Royal Wharf. Taking place between 6.30pm and 9.00pm, guests will experience a comprehensive tour of the unique 3,385 homes scheme, followed by an architectural presentation and drinks reception in the Marketing Suite. Situated at the heart of the scheme, the Marketing Suite, with its two roof terraces, is the ideal location to experience the sheer scale and architectural innovation of the scheme, while offering sweeping views of Greenwich Peninsula and the Thames Barrier. For more information and to RSVP please visit [Insert LFA website event listing on 2nd May]. Royal Wharf is defined by its rich variety of architectural styles as well as its plethora of open and green space. Inspired by the traditional Georgian architecture of Belgravia and Fitzrovia, the mixture of brick townhouses and apartment buildings are reflective of a classic but contemporary design that makes use of industrial materials in testament to the heritage of the surrounding Docklands. This array of building typologies is underpinned by the range of architects involved in the design of the scheme, with Glenn Howells Architects overseeing the development as master planners and Whittam Cox Architects being the executive architects of the project. 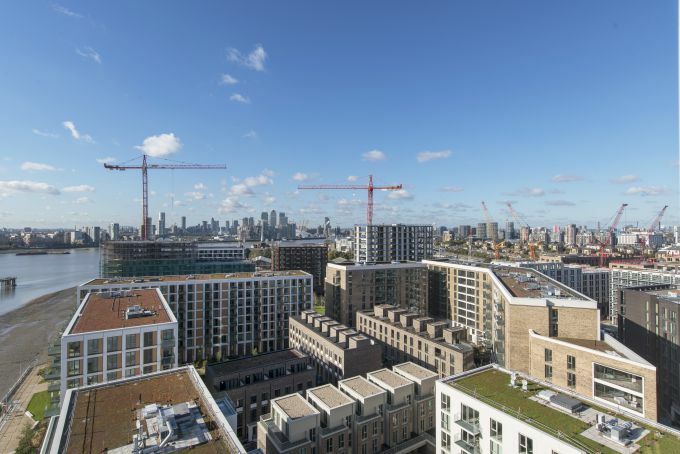 Design competition winners Mae Architects and Serie Architects have provided the design for Park View Place and Sienna House respectively, while David Morley Architects have designed Royal Wharf’s world class leisure facility. The variety of architectural styles is complemented by access to green and open space. Indeed, residents will be able to step out of their apartments onto the new 500m riverfront promenade which leads to the two riverside parks which border the development, Barrier Park and Lyle Park. The London Festival of Architecture is a city-wide event which brings together designers, architects and curators to share ideas on architecture and its impact on the capital. The theme of this year’s festival is ‘Identity’, a concept which seeks to celebrate those projects which both reflect and add to the unique identity of London. Royal Wharf has been instrumental in shaping the new identity of Royal Docks, leading the charge for regeneration in the area through the provision of new homes, green spaces and state-of-the-art amenities. Developed by Ballymore & Oxley, Royal Wharf is a landmark new neighbourhood located in the heart of the Royal Docks regeneration area. The scheme will see the creation of 3,385 homes for approximately 10,000 residents and the first residents moved into their new homes in early 2017. It was recently announced that the development had completed its 1200th home, with a further 1,000 units due to complete in 2018. This is reflective of the unprecedented pace and scale of development, facilitated by innovative construction techniques and driven by Ballymore & Oxley’s desire to create new neighbourhoods rooted in quality and heritage.